The Arbor Day Foundation has honored Indiana State University as a 2009 Tree Campus USA University for its dedication to campus forestry management and environmental stewardship. This is the second consecutive year Indiana State has earned the Tree Campus USA designation. ISU was the first campus in Indiana to receive the recognition. "The Tree Campus USA program will have a long-lasting impact at Indiana State as it engages college students and local citizens to plant trees and create healthier communities for people to enjoy for decades to come," said John Rosenow, chief executive of the Arbor Day Foundation. "The school will benefit from exceptional tree-care practices on campus as it works with tree-care professionals in the community to improve the tree canopy in Terre Haute." Indiana State met the required five core standards of tree care and community engagement in order to receive Tree Campus USA status. Those standards are establishing a campus tree advisory committee; evidence of a campus tree-care plan; verification of dedicated annual expenditures on the campus tree-care plan; involvement in an Arbor Day observance; and the institution of a service-learning project aimed at engaging the student body. "We're pleased the Arbor Day Foundation has again recognized Indiana State's commitment to Tree Campus USA standards. Maintaining a healthy and robust urban forest not only improves the appearance of the ISU campus adjacent to downtown Terre Haute but it is a vital component of the university's commitment to environmental sustainability," said Kevin Runion, associate vice president for facilities management. The Arbor Day Foundation launched Tree Campus USA in the fall of 2008 by planting trees at nine college campuses throughout the United States. More information about the Tree Campus USA program is available at www.arborday.org/TreeCampusUSA. 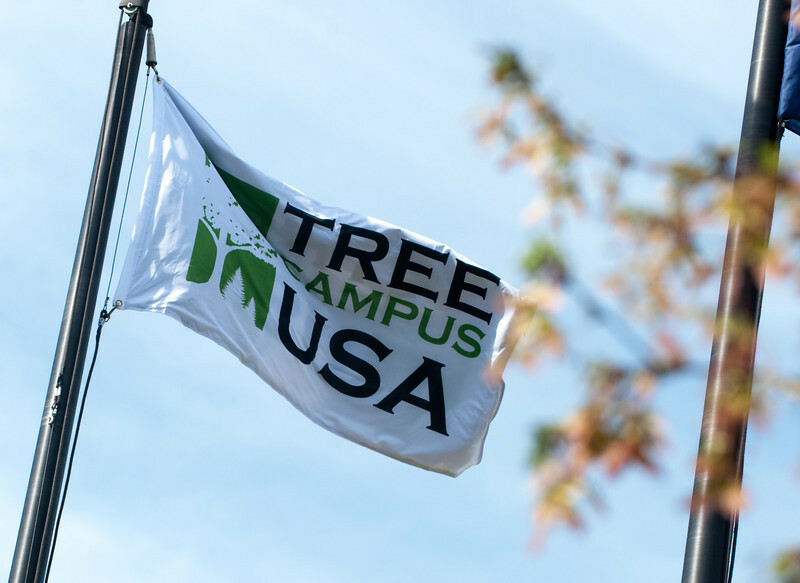 Photo: http://isuphoto.smugmug.com/Events/Tree-Campus-USA-flag-raising/042309treeUSAcampus-142-of-218/519229895_PP52V-L.jpg - The "Tree Campus USA" flag will continue to fly at Indiana State University.